Hatters midfielder Alan McCormack may well be rested for tonight’s Carabao Cup clash against Ipswich Town to ensure he is in tip top condition for the trip to Barnet on Saturday. 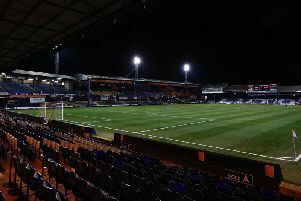 The 33-year-old had endured an injury-hit campaign with Brentford last season, as Saturday’s debut for Luton was his first first league start since September 27. He only managed two games in a week last term too, as on the chances of featuring this evening, boss Nathan Jones said: “We’ll see how he feels. McCormack himself knows just how vital it is to manage his body, as he looks to up his minutes and complete a full 90 for the first time since April 2016 in the coming weeks. He was brought off after 64 minutes, with Hatters leading Yeovil 6-1 at the weekend and continued: “It’s building blocks. It’s been a while since I’ve got close to 90, you can’t just go in and expect to play 90. “The scoreline helped and I did feel fine coming off, last week I had a little bit of cramp after 60, so it’s protection. “But I’m feeling great, strong, fit, just keeping that going and during the week is vital for me. “It’s vital we look after my body and training the right amount of numbers and right amount of time on the pitch, time with strength in the gym. Team-mate James Collins knows how important a fresh and firing McCormack is for Luton too, adding: “He’s so under-rated Macca.